The origins of this unique sample of wallpaper are unknown although it was most likely produced in France or Austria in the 1920s. Paul Frankl, prominent early modernist designer in the United States, gifted the wallpaper sample to Sarah and Eleanor Hewitt in 1930. The wallpaper is remarkable for being Cubist in style. The use of a still life, a common Cubist genre as the decorative motif of the wallpaper, as well as the geometric and multi-dimensional perspectives of the still life on a two dimensional plane are characteristic of Cubism. The limited palette predominantly of gray reflects the use of muted tones included in many Cubist works of art. However, the diluted representation of an art movement deeply rooted in intellectual theory becomes simply an aesthetic portrayal in this unusual example of an attempt at Cubism in wallcoverings. Here we see Cubism reduced to a decorative motif, with little connection to the paintings of Picasso and Braque. Another Cubist element is the use of initials, reminiscent of paintings such as Pablo Picasso’s The Fruit Dish , which are often representative of newspaper titles or other discernible meanings . The AJD may be a monogram of the person for which this high-end wallpaper was produced. The use of block printing in creating the wallpaper would have allowed for ease in altering the monogram for multiple commissions. 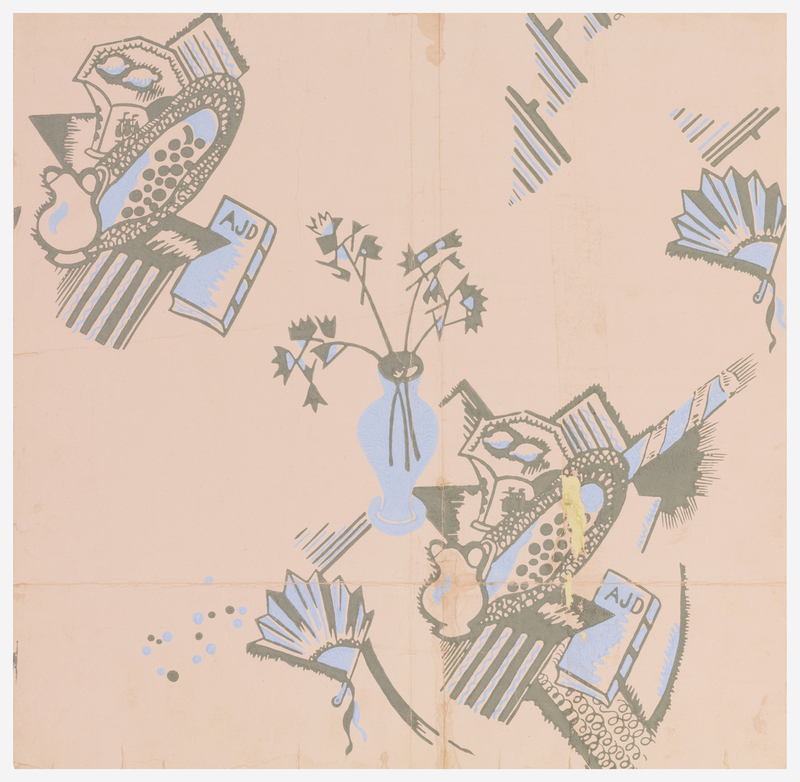 Great find… there are so many cubist wallpapers…love those of Ruth Reeves.